After running software, connection wizard will display to connect your databases either on remote location or locally. 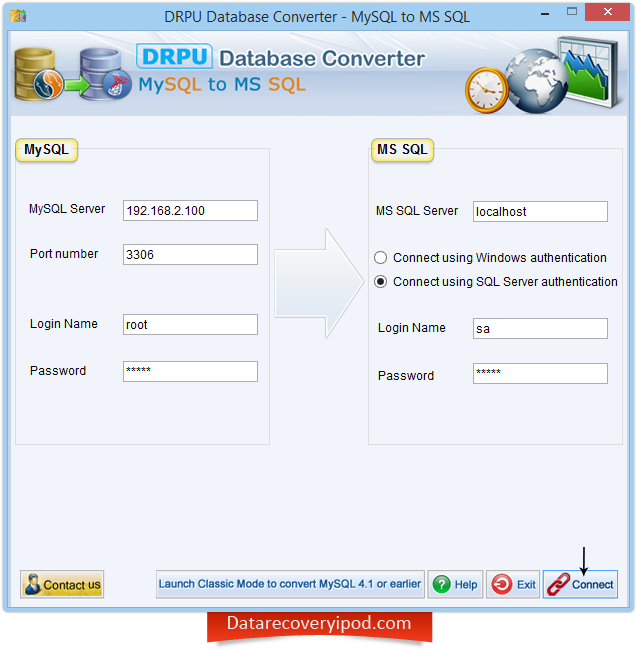 MySQL to MS SQL Database Converter Software converts selected particular table’s records or entire database created in MySQL database to MS SQL database server. Database converter utility provides facility to convert table definitions only. You can also skip indexes conversion. DB Software facilitates user to convert views easily. Database software supports all necessary attributes including null values, unique and primary key constraints etc. You can save converted MySQL database into new database or overwrite the existing MS SQL database records as per requirement. • Facilitates user to convert table (s) definitions only. • Provides option to convert views. • You can skip conversion of indexes as per requirement. • Converter software easily works with all major versions of MySQL. • Software converts MySQL database into MS SQL database with support to all important attributes and default values.